Children's Stories - Give Me Back My Ball! "ARF! ARF! ARF! It looks like Harry McFarlane is building an addition onto his house," Mussels said. A soft breeze blew his white fur about like dancing feathers. "Say, Cockles, would you like to get a closer look?" "ARF! ARF! ARF! Aye," he answered, his long, stiff tail wagged with excitement. "Maybe one of the workers has left a sandwich lying around. Maybe its smoked haddock." His drooping ears bounced up and down as he ran to the mulberry bush. "Let me grab my ball first." He picked it up in his mouth and ran back to Mussels. "You and that blue ball. Can’t we just go one place without it?" Mussels asked. Cockles shook his head back and forth. "Well then, come on." They ran towards Harry’s. "There’s a lot of banging and hammering. What’s he building?" Cockles asked, mumbling because of the ball being held in his teeth. "How would I know? It does look like an extra bedroom or living room. Let’s go around the front garden, so the workers don’t see us," Mussels suggested. There were large cement pipes, pieces of wood, bags of nails and power tools lying all over the grass. Mussels went around sniffing everything, searching for something to eat, while Cockles tossed his ball high into the air and then ran to catch it. While Mussels was examining a nail gun, Cockles ran about, pushing the blue ball with his wet nose. "Oops," Cockles said. "My ball’s gone and rolled into one of those pipes. Mussels!" he shouted. "Come and help me get my ball!" Mussels trotted over to Cockles. "Will you keep it down. If the workers see us, they’ll chase us away. I know I smelled mince ‘n tatties. I wonder if Harry’s fixing that for supper. Oh, sorry," Mussels said, noticing Cockles staring at him, "what’s the problem?" "My ball. It’s rolled into the pipe. I can’t reach it. Your legs are longer. You try, will you?" Cockles begged. Mussels lay on his tummy and stretched his front leg into the pipe. He tried to put his head in but it was too big. "Och, I can’t reach it. Why don’t you just crawl in and get it?" Mussels asked. "What? Crawl in there?" Cockles said, acting shocked at the thought. "Well, Cockles, if I get the ball, I’m keeping it. If you want it, you go in and get it!" Mussels threatened. "You can’t have my ball. It’s mine. I’ll go in after it. Don’t wander too far though, in case I get stuck," Cockles said. He lay on his tummy. The grass poked into his face and tickled him. He brushed it out of the way and put his front legs out in front and slithered into the cement pipe. "Och, this is a tight squeeze. I can hardly breathe." Mussels ran off to do some more exploring. He headed for the pile of wooden beams lying stacked up, near the front door. "I can almost reach. There…there….there. I’ve got it. I’ve got the ball, Mussels!" Cockles shouted, but Mussels didn’t hear. "Och, how am I going to get out of this pipe?" He tightened and contracted his body and inched his way forward slowly. "I’m almost there," he sighed. It took a lot of effort to move. 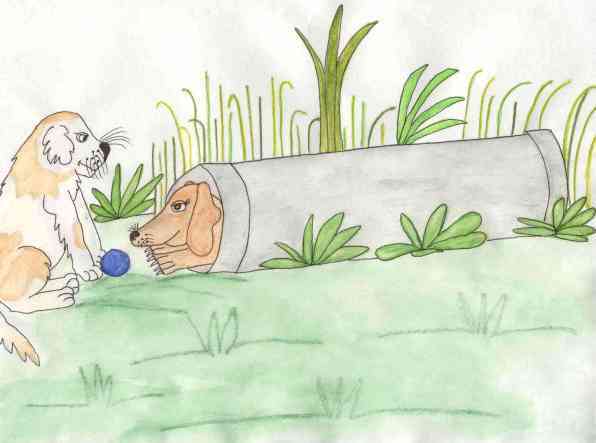 "Och no," he pouted as the ball rolled out of his paw and out of the pipe. "Mussels! Mussels! My ball! Get it, will you?" Mussels saw the ball roll out. "Hee hee. He’s lost his ball. I’ll just have to have a wee go at it while he’s still in there." Mussels ran and got the ball and held it in his mouth. He stuck his face in the end of the pipe and saw Cockles all squished inside. "Hee hee. I’ve got the ball now. I’m going to play with it. Good luck." Cockles shouted, "My ball! You bring that back. When I get out of here, I’ll get you, Mussels!" He began to squirm and wriggle about. Finally his front paws were out of the pipe. He grabbed onto the grass and pulled, and tugged, and pulled, and tugged, and finally squeezed out of the pipe. "Whew, that was not fun!" He shook himself, trying to un-squish his body and then jumped up and down a few times to get feeling back in his legs. "There! That’s much better. Now, where’s Mussels." "Hee hee. I’m over here, Cockles and I’ve got your blue ball. Come and get it," Mussels teased. "I want my ball," Cockles shouted and ran towards the white dog barking. "ARF! ARF! ARF! Give it to me," he called. Mussels grabbed it in his mouth and ran around the pile of wood, tossing the ball into the air. He then ran into the back garden. "Hey! It’s a dog. Get out of here. Go home!" one of the workers shouted. Mussels ran away, heading towards home. Cockles searched all over for Mussels. He looked behind the woodpile, around the bag of nails and next to the power tools, but couldn’t see Mussels anywhere. He ran into the back garden. "What’s this? It’s another dog and it looks like an undercooked sausage." The worker laughed, "Ha ha ha ha ha," and then shouted, " Go home. Go away. Shoo!" Cockles saw the worker pick up a stone. He tossed it at him. "Go away!" Cockles ran as fast as his short legs could take him and didn’t stop until he was home. Cockles stood panting. "Where’s Mussels? I want my ball back." He slowly crept into the back garden. Mussels wasn’t there. He climbed in through the flap on the wooden back door of the house and found himself in the back room, where their baskets were. There lay Mussels. He was curled up sleeping. The blue ball lay near his mouth. "Aha," Cockles smiled. He slowly walked over to the basket, grabbed the ball, climbed back out through the doggie door and ran into the back garden. "I’ve got my ball. I’ve got my ball. I’ve got my ball," he giggled and spent the rest of the day tossing it into the air and rolling it around the flowerbed.